Enjoy a thrilling walking safari in remote wilderness with home comforts, good food and rest at Zungulila, a tented camp in Zambia. From the comfortable and restful safari en-suite tents, guests at Zungulila Camp can emerge to start the day refreshed and ready for another exciting day at this Zambia lodge accommodation. This tented camp in Zambia is positioned on a knoll overlooking the expansive Hippo Pools plain, where a natural spring flows all year - providing the perfect place for abundant wildlife to congregate and drink. 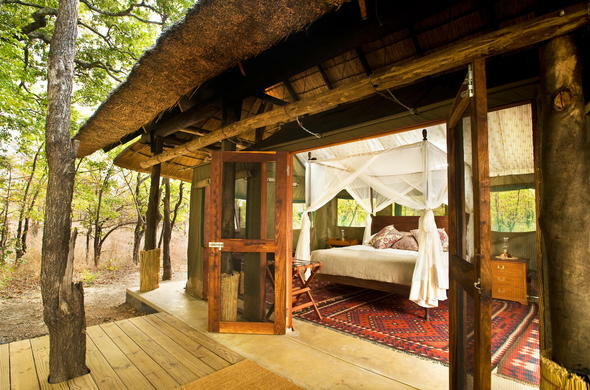 At Zungulila, there are 4 large, attractively furnished tents under thatch roofs. All the tents have big bamboo verandas so guests can relax in private and clearly see the amazing variety of animals around the pools of the spring. The en-suite accommodation has running hot and cold water, classic wooden furnishings and large four poster beds with draped netting; basic laundry arrangements are catered for.